Another year has passed and the fuel tax has been cut again. 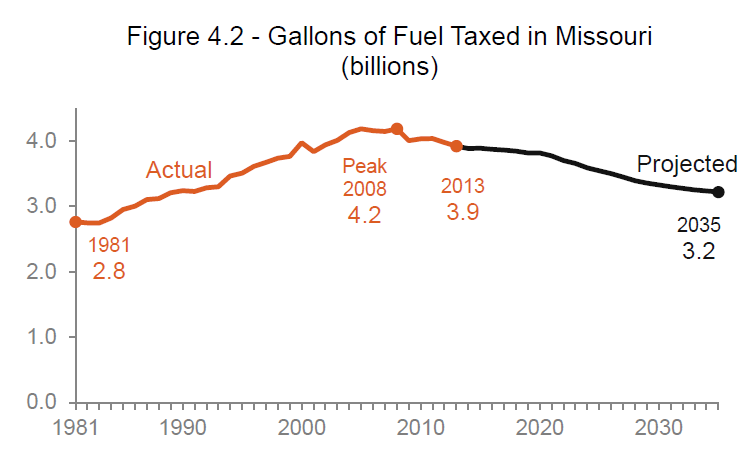 Since Missouri’s fuel tax is fixed at 17 cents a gallon, its buying power is eroded over time by inflation. Fuel buyers also escape the ever increasing sales tax. 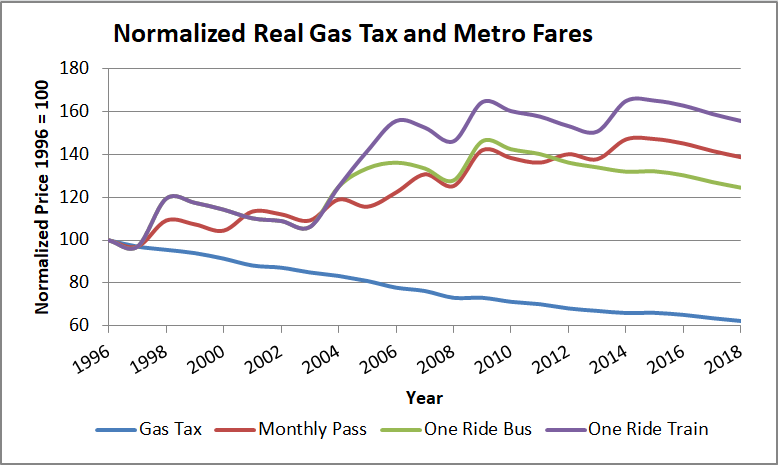 As I have noted over the years transit users have seen their fares not only keep up with inflation, but far outpace it. MoDOT’s financial health saga continues with the roundly rejected 0.75% sales tax proposal in 2014, bills that would increase the fuel tax a little, which wouldn’t require a state-wide vote by the Hancock Amendment, and larger ones which would require a vote, and even subsidizing driving by shifting money from general revenue to MoDOT, have not gotten across the finish line. 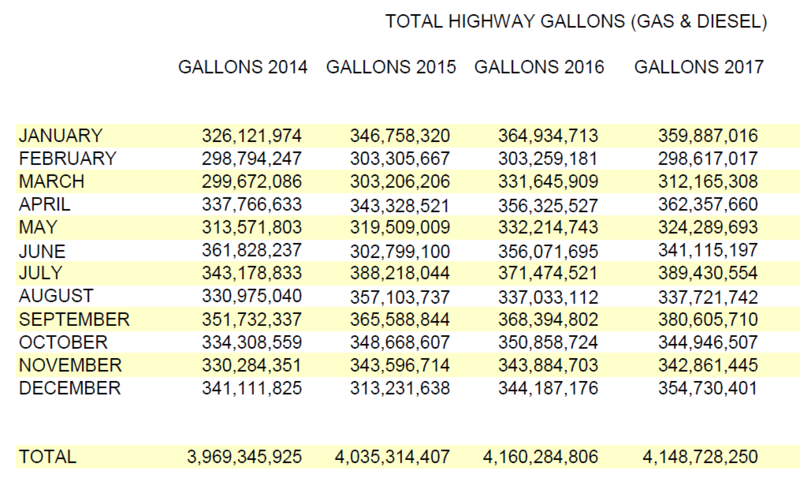 Luckily MoDOT’s sky-is-falling prediction that fuel consumption would wither has not come to pass, so with robust fuel sales and the passage of the FAST Act by Congress, the dreaded missing out of Federal matching money has not occurred yet. Even with steady fuel consumption, MoDOT is loosing ground. Drivers have to consume more and more to make up for the lost buying power of the fuel tax. Plus the fact that cost of road work rises faster than the consumer price index means maintenance needs, let alone expansion fantasies, are far from being met. HB 2035 would put forgone tax credit redemptions into a transportation fund. HB 2091 would allow voters to consider a 10 cent increase in the fuel tax. A 10 cent increase puts the fuel tax at its buying power in 1996. Nowhere the kind of increase transit riders have seen. It would raise over $400M per year. The 21st Century Missouri Transportation System Task Force report says Missouri is short $825M per year of meeting its infrastructure needs needs. That would take a 20 cent increase in the fuel tax. HB 2147 would raise the fuel tax a commensurate amount to the revenue reduction due to the income tax cut passed in 2014. It removes the general revenue growth requirement that triggers the income tax cut. HB 2149 would increase the fuel tax by 17 cents per gallon and ensure that natural gas used for road transportation is taxed accordingly. HB 2154 would shift state sales tax revenues (excluding those dedicated for schools) to the road fund starting at 1% in 2019 and rising one percentage point per year until it’s 10%. Another attempt to subsidize driving, digging the hole deeper. HJR 74 proposes a constitutional amendment to authorize the highways and transportation commission to construct toll roads and impose and collect tolls on interstates and four-lane roadways. Tolls would be most welcome. Our road system is mispriced, so feedback mechanisms that might constrain its growth are weak or non existent. HB 2092 authorizes, upon voter approval, a ten-cent tax increase on motor fuel and twelve-cent tax increase on diesel fuel. A higher diesel tax would be most welcome considering the many times more damage that heavier vehicles do to roads and bridges. SB 619 allows the Highways and Transportation Commission to issue up to $65 million in bonds for the engineering and construction of transportation infrastructure projects in St. Charles County that meet certain criteria. State debt is needed for booming St. Charles County?! Such a prosperous place surely should be able to pay for its own infrastructure. SB 734 increases the motor fuel tax from 17 cents per gallon to 27 cents per gallon. Somehow without a vote. I doubt that can go anywhere. What is missing is reform. Tolls would be a good start. Our system is over-built and mispriced. The state has spread out our cities and towns, destroying wealth by undermining property values and sending more wealth out of communities, and the state as a whole, in the form of vehicle, insurance, and fuel purchases forced by built environments that offer no freedom of choice, all the while putting each of us on the hook for more and more infrastructure. Many miles of roads should be bequeathed to counties to maintain (or not) as they see fit. MoDOT is responsible for the seventh most lane miles or any state DOT, yet Missouri is far from the seventh most populous nor in economic output. Our road system is outpacing our ability or desire to pay for it.